MamaBreak: Soda Stream Review-- We LOVE it! Soda Stream Review-- We LOVE it! 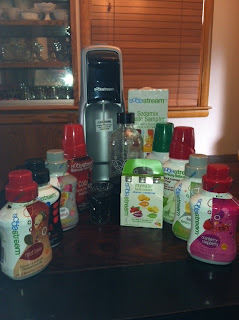 I am still in awe over this amazing package that Soda Stream sent to MamaBreak for review! It is AMAZING! I was skeptical of the quality of soda it would make. If it tastes so amazing, why wouldn't everyone own one? Well, everyone SHOULD own a Soda Stream. I included the soda that we made in the picture. The kids got first choice. They chose Root Beer, and I have to say, I think it was some of the best Root Beer I have ever had! The kids LOVED pushing the button to carbonate the water, and I loved that it took so little to make such a great drink! There are many different flavors to choose from. It eliminates waste by allowing you to reuse the larger bottle. It takes up less space in your fridge. AND it tastes amazing and takes minutes to make! Want a special code to save $10? Email MamaBreak at mamabreak@mail.com and we can send you one! We love our Soda Stream, and we know you will too! I received this item for free to review on MamaBreak. However, the opinions expressed here are my own. cool idea i love it! we drink so much soda here i mean gallons lol! this would be great!! Ahhh I want one of these so bad! How nice of you for the coupon code! Can't wait to get mine! The Knot Genie will Brush Away the Snarls! NuNAAT Chocolate . . . Prepare to Fall in Love! 20 Free My Coke Rewards! !